Lyle: In this lesson you'll be learning a strumming pattern/rhythm riff that is very common and can be used in many songs. Lyle: The rhythm pattern I want to show you is confusing for some beginners to get sometimes, so I'm going to take it slow, going in sections, and working up to the full rhythm. Lyle: Loop the TAB notation to play along with me, or use the looping jam track. pete: In the jam track, is the bass just a open E then a G on the E string? 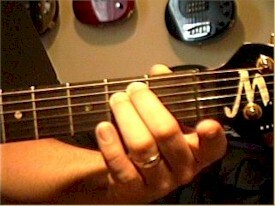 BigTX: I notice you keep the strum hand in motion even though your are not touching the strings. Lyle: Good point, That helps you keep the timing and the groove going. Lyle: The down beats/strums are the numbers. 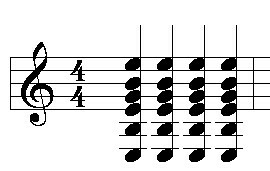 The up beats/strums are counted as "&" or "and". Lyle: Loop the TAB notation and play along with me. You can slow the TAB down if you want too. See if you can count out loud with me while you play. Play back the TAB file. Select the loop button and count right along with me. BigTX: Yes, can you explain it? Lyle: It's just what the Em chord looks like and the rhythm pattern as notated in staff notation. If you know how to read music, that's what it looks like. Lyle: This is a rhythm pattern that works on many songs. Make sure you're playing it exactly right, with the right down and up strums where they should be. Lyle: Now you can try playing this rhythm pattern to this simple chord progression. 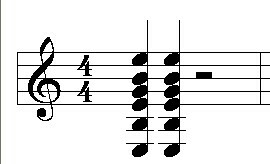 Lyle: Try playing rhythm 6 in each measure of the 8 bar jam. Lyle: Your goal for this lesson is to be able to play the 8 bar jam right along with me. Memorize the chord progression and then use the looping jam track to play with me. Lyle: If you're having a tough time keeping in time with me, it could mean you're strumming in the wrong direction for some of the beats. Al: So it's the same strumming pattern and we just rotate through each chord? Lyle: Al, yes, try playing rhythm 6 in each measure of the 8 bar jam. Steve: What is the last chord you're playing in the 8 bar jam? Lyle: I run into this rhythm pattern over and over again with students when I'm teaching them songs. Lyle: That's about it for this lesson. See you at the next lesson!